This research investigates the different aspects of operations management related to a specific organization. This organization is an oil and gas producing company called OilCap. Because it operates globally through its up and downstream activities, the elements of operations management are divers and complicated. This research focuses on the different aspects of process design and product and service layouts. What is analyzed are the different dimensions of operations management related to process design and layout types of products and services within OilCap. Both up and downstream products and services have different goals, characteristics, a heterogeneous client base and supply chain that show dissimilar, incomparable and often opposite process and layout needs. This leads to the conclusion that the forecasting and supply chain management techniques could show similar contradictory demands. This study shows indeed similar phenomena. It is explained what these differences are and how they can be served towards an integrated approach related to process design, product and service layouts, and forecasting techniques and supply chain management. In the end this study looks at the lean principles, six sigma and related models to investigate and describe how certain elements of operations management for OilCap can further be improved. The final part of this study reflects on some conclusions and recommendations on what needs to be done and the way forward. OilCap is an organization that delivers products and services to customers producing or consuming oil and gas. Its operations are spread around the globe and reach the Americas, Europe, Asia and Africa. While both worlds of product and service delivery are very complex on their own, a mixture of these two makes the operations management game suddenly exponentially more complicated. Through healthy self-reflection OilCap asked for a report wherein the theories around operations management for manufacturing and services are described and related to the company. What are the pitfalls, where can processes and procedures be changed and what are the improvements OilCap could integrate in its operations management procedures? There are two main sections in this report. First an overview is given in the Findings section about what operations management is, what important elements there are for process design improvements and how this can be related to OilCap. This part concludes with a reflection on the Lean principles and its applicability for further process improvements within OilCap. The second section provides conclusive information and recommendations on how OilCap could enter the future with a solid operations management foundation. Operations management for OilCap is complex because it offers services and products within their upstream and downstream activities. For a good understanding of these services and products this research starts with a short description of these operations. Upstream activities consist of searching for and recovering crude oil and natural gas. OilCap liquefies and transport gas and operates the upstream and midstream infrastructure needed to deliver the oil and gas to the market. Downstream activities consist out of manufacturing, distribution and marketing for oil products and chemicals. The manufacturing and supply parts consist out of refinery, supply and shipping of the crude oil. OilCap delivers projects that drive its research and innovation capabilities and creation of innovative technology solutions. These projects provide technical services and technology capability solutions for the up and downstream activities. Many definition of operations management do exist but they can be brought together in being the management or activities of systems or processes that create/produce goods and/or provide services. Other characteristics of operations management are that it is important for almost any organization, it is an exciting field to study, challenging to grasp and control and it can be found everywhere within OilCap (Stevenson, 2012; Slack, 2010; Porter, 2009). Operations management is important in creating the procedures and structures around the processes of OilCap to create goods and services. Operations management also plays a major role in the business process management (BPM) and reengineering when competitive questions demand a restructuring of organizational processes within OilCap (Reid, 2011; Leseure, 2010). This means that operations management is key to initially define the business processes for OilCap but also elementary in redefining them when the need arise. Operations management for OilCap is highly complex because it consists of managing products and services. Both need specific operations management strategies while aggregations into final products and services have their own complexities. 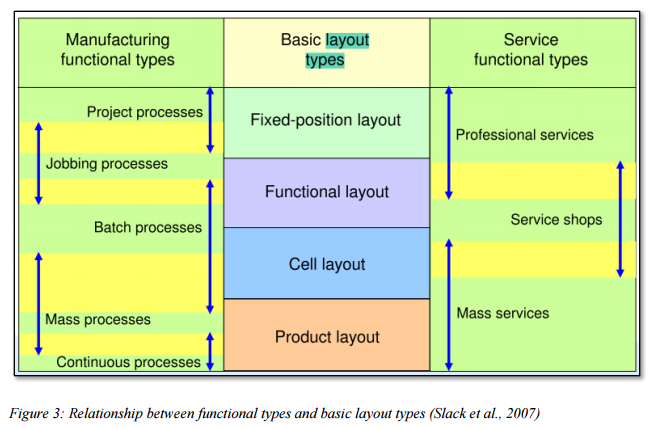 See Appendix A, figure 3 about the relationship between functional types and basic layout types (Slack et al., 2007). It presents an indication of the intrinsic complexities of interrelated manufacturing and service delivery. It can be used as the foundation upon which OilCap can base its operations management analysis. Because of the highly complex operations management procedures within OilCap for its up and downstream activities and the changing market towards alternative fuels, there is a demand for more quality and flexibility towards the reengineering of business processes and total quality management of products and services OilCap delivers. Here a separation of concerns within OilCap must be implemented towards the operations management of products and services where this separation is not present. This means an alteration of the scope of operations management within OilCap to increase the efficiency and quality of the conversion of inputs into outputs related to its products and services (Cooper et al., 2005; Porter, 2009). Without these adjustments OilCap will lose its competitive market position. Process design has a tight relationship with quality management to facilitate doing the right job at the right time with a minimum amount of resources. It is about designing products or services that meets or even exceeds what the customer wants (Stevenson, 2012). The design of the processes within OilCap is done before the creation of the products or services. There is an interrelationship between the design of services, products and processes within OilCap and they must be analyzed together or the current misbalance will increase with more negative effects (Slack et al., 2010). Different types of processes must be defined for the products and services OilCap provides. They can be grouped from highly specialized in downstream towards generic types of products and services in the upstream activities of OilCap (Kumar & Suresh, 2009). These processes within OilCap must be optimized to improve the quality and time to market of its products and services. The highly specialized products and services of OilCap need a skilled workforce and flexibility to serve its differentiated client base. This is opposite to their generic products and services, where variety and variation is often lower and flexibility nearly absent. Highly specialized for OilCap means low in quantity where generic products and services are produced in high quantities (Hayes & Wheelwright, 1984). See Appendix A, Figure 1 & 2, reflecting the correlation between process types and service types and their relation with volume and variety. What OilCap must extract from this is that the more specialized their product is, the more professional the connected service must be. When the product is batch, mass or continuous the services of OilCap must become more generic. OilCap puts too much energy in specialized services leaking money and not adding real value. Project is the most complex process type within OilCap and continuous the least complex one. Most complex means highly specialized, flexible, low in volume and with greater variety and flexibility. Lower in the rank towards continuous means less complex, lower specialized and higher in volume, flexibility and variety (Hayes & Wheelwright, 1979). Because OilCap serves both the mass market with its oil and gas transport, drilling locations and refinement fabrications in its upstream activities, it needs to align its related services accordingly. These services are different than the ones used in its downstream activities, where the services and products are more specialized and specific in nature. To increase its competitiveness OilCap must fine-tune and upgrade the fit between the type of products it offers and the services they are embedded in. This is currently not the case and the services are not balanced between its upstream and downstream activities resulting in lost customers, failures in drilling activities and expensive production lines of oil and gas reflected in the high price customers pay. Proper process design should be implemented and it must become one of the foundational elements around OilCaps service and product design. With process design comes automatically process layout, which is about where to put the processes of OilCap and in what ways can they be connected to form the perfect flow for specific situations (Stevenson, 2012; Beech & Visser, 2005). Process layouts are about grouping together resources within OilCap needed for related processes and activities. That’s true for services as well as manufacturing. Often different layouts are needed for services and products. They concern the process types of manufacturing and services related to volume, variation, variety and visibility (Reid, 2011). An important advantage of process layouts for OilCap is better use of time, money and resources with greater flexibility. Flexibility comes through increased distribution of physical tools and employees when their process layouts are optimized. In many cases a combination of process layouts are used to form the perfect fit (Kumar & Suresh, 2009). These elements must be optimized to increase the benefits on total cost of ownership, return on investments and quality of control in the supply chain of OilCap. Product layouts are about combining resources together in an optimal sequence for efficient product creation. Hybrid layouts on the other hand are a combination of product and process layouts to create the optimal economical production process (Reid, 2011). The complex organizational processes of OilCap need these hybrid layouts more than the single or combined process and product layouts. This is also reflected in its supply chain demanding these combinations (Russell & Taylor, 2011). OilCap has many processes within even so many different phases of the products. The upstream processes of OilCap concerns fixed position layouts when drilling locations produce and transport the oil and gas where the downstream products and services are focused on process, functional, cellular and product layouts. Process layouts are used in the refinement locations when the oil is brought to the surface and needs its first transformations to more workable and useful variations. Cell layouts are used for just in time products after the first refinements of oil into half fabricates further down the supply chain (Russel & Taylor, 2011; Leseure, 2010; Stevenson, 2012; Porter, 2009). Although these activities and process layouts are defined within OilCap, it is obvious that the efficiency is below acceptable parameters and many layout types are filled with unnecessary activities that do not add to the quality and speed of its production process. OilCap must increase the efficiency towards its process and product layouts. This is important to become competitive again through increased quality and time to market speed of its products. Forecasting is analyzing what will happen in the future with the products and services produced by OilCap. Forecasts provide information about future needs of its services and products and guide the operations management decisions of OilCap (Stevenson, 2012). Often forecasts form the basis for the budget and resource management decisions of OilCap related to a possible decrease or increase of future demands. Both are elements of the capacity management process where forecasting about resources and demand are fundamentally integrated (Tipton & Krause, 2008; Turban et al., 2013). Two main differentiations are made called quantitative and qualitative forecasting. They can be related to qualitative and quantitative research where the first is based on more subjective interpretable elements and the latter more on quantifiable constructions like models, tables and the like (Slack, 2010; Reid, 2011; Lesuere, 2010). Both have different outcomes and should be used for specific situations. Forecasting can be found on different levels within OilCap and qualitative forecasting is more done at the strategic level where quantitative forecasting is often found at the tactical and operational levels (Trantis, 2013). Qualitative forecasting can be contra dictionary to the basic elements of forecasting being timely, accurate, reliable, reflected in meaningful units and simple to understand (Stevenson, 2012). Forecasting techniques on the higher strategic levels within OilCap do produce results not always compliant with these rules while main decisions are being made on the outcomes (Trantis, 2013). These results are currently often misinterpreted within OilCap and this deserves more attention. OilCap has activities in many different locations and all of them need different macro and micro forecasting. On the macro level the Political, Economic, Social, Technological, Legal and Environmental (PESTLE) forces play an important role, which demand a qualitative forecasting approach. The micro levels of OilCap are better served with quantitative forecasting because they are more concerned with the lower level products and services like batch, mass and continuous which are more quantifiable (Trantis, 2013). For the lower level products of OilCap the inventory management, capacity and aggregate planning can well be served with quantitative forecasting and accordingly adjusted when needed. The political regulations, implications when certain technologies cross borders, different economics within countries, governmental rules and cultural differences must be integrated in the qualitative forecasting of OilCap. Together they form the future planning of its process design and product and service layouts to implement the improvements and adjustments where and when needed. The supply chain of OilCap concerns the management of its products and services in the up and downstream activities to buy or sell parts or whole products. The type of service or product dictates partly the type of supply chain management. 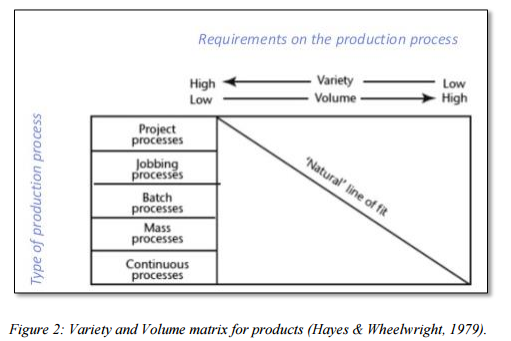 The spare parts supply chain management of batch, mass or continuous products is often different than products higher in the upper left regions of the model of Hayes & Wheelwright (1979), see Appendix A, figure 1 & 2. Reality within OilCap shows a mix of products and services where they do not belong. The connections between process layouts and manufacturing and service layout is reflected in Appendix A, figure 3. Within OilCap these correlations do often not clearly exist resulting in decreased efficiency and quality and increased time to market of its products and services. Spare parts supply chain within OilCap exceeds the single scientific approach concerning hard and soft sciences and must be approached accordingly (Martin et al., 2010). In the downstream of OilCap this spare parts supply chain demands specific qualities in its deliverables. In the upstream it needs more care when OilCap buys services and products when implementing its infrastructure to produce and transports oil and gas. An important element of successful supply chain management and development is to what extend the organizational culture of OilCap is able to implement effective project and operations management between the links involved and how well ingrained the commitment of strategic management is (Johnston & Clark, 2005). Because OilCap operates with many different cultures, extra care should be given to these aspects. Supply chain management has often still not entered the strategic layers and board rooms where project management on the other hand is clearly present. The same is true for OilCap. This has a negative effect on its up and downstream activities and therefore the supply chain of OilCap must be better embedded in project management (Ayers, 2003). Some research exists pressing on a better integration of project management, supply chain management and procurement to increase the efficiency of an organization (Morris & Pinto, 2003). OilCap could benefit from this and must implement this integration for efficiency improvements in the supply chain. When this is done properly it will have a profound positive influence on the growth and performance of the suppliers in the supply chain (Rensburg, 2013) and indirectly on the overall efficiency of OilCap. Lean principles in operations management are about creating the right balance between what is needed to produce services and products and finding an approach to eliminate the steps that do not add extra value (Stevenson, 2012). To achieve this, organizations often use the ‘five steps’ of the lean principles. These five steps can also be found and are related to the five-step process of Six Sigma (Russell & Taylor, 2011). Both lean principles and Six Sigma are needed within OilCap to combine the elimination of non-value-added activities and statistical process control and improvement of process speed and flow (Stevenson, 2012). 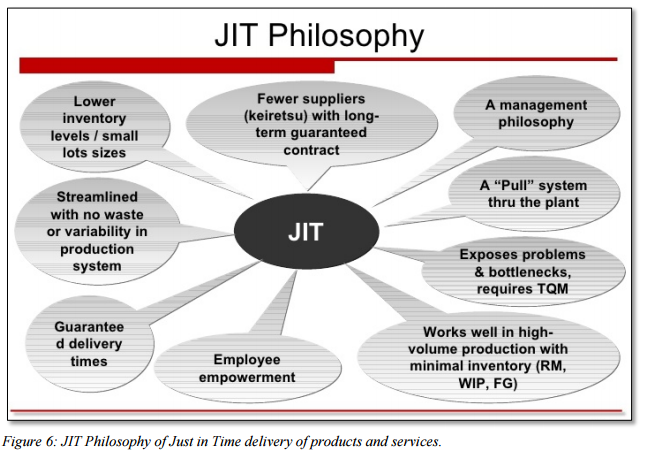 Just in time (JIT) production and delivery of goods and services within OilCap forms a natural fit with the lean principles and Six Sigma (Reid, 2011). See Append A, figure 4 & 5. JIT is a natural outcome when the lean principles and Six Sigma are properly adjusted and implemented. Producing and serving at the right time and at the right moment improves automatically the use of resources, within the highly coordinated and optimized processes of OilCap (Slack et al., 2010; Stevenson, 2012). See Appendix A, figure 6, reflecting the areas if JIT. Besides the lean principles there is something called the lean manufacturing system where suppliers produce small amounts of deliverables when needed (JIT), among other optimized processes, to avoid having production machines and processes running when not necessary, see Appendix A, figure 7. 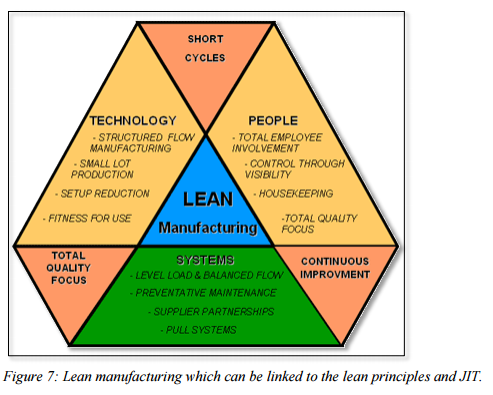 Lean manufacturing is mainly related to products, where the lean principles focus more on general use related to services and products (Turban et al., 2013). OilCap often use broadly defined production processes which could benefit from lean (manufacturing) principles and the use of JIT delivery to make them more specific and only available when needed. The lean principles are not only applicable for the supply chain but also useful for project management. For OilCap this is twofold. The principles can be used to optimize the processes of project management but also project management itself can be used to implement the lean principles within the supply chain and production process (Brennan, 2011). When project management within OilCap is optimized accordingly, automatically the services and processes will be optimized and just in time delivery can be applied to its full extend. OilCap must implement sustainable operations management procedures where currently many ingredients are based on a mixture of intermingled processes while loosely coupled responsibilities are a better fit. Because of its up and downstream activities, different process designs, products and service layouts and forecasting techniques are not always used at the right moment, for the right purpose and with the expected results. This report shows that operations management is well embedded in the philosophy and structure of the organization. Process designs with product and service layouts are targets of intense analysis and embedded in tactical and strategically forecasting and planning techniques. But through a lack of knowledge and sustainable processes around these elements, it seems that their constructions became fuzzy and unwittingly intermingled. The risk exists that OilCap will lose its grip on the matter with devastating competitive results. In most cases a separation of concerns must be implemented for the different kind of products and services being delivered by OilCap. A better differentiation must be made between the types of products and services and this must also be implemented between its up and downstream activities. When these elements are not fundamentally re-analyzed and adjusted to the changing needs of OilCap and its customers for the current situation and future changes in demands of its products and services, OilCap will lose its leading position in the world and an overall downfall seems unavoidable.